If you are looking for a means to send emails with colours, tables and graphics, you have come to the right place. 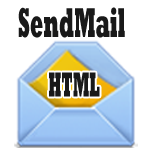 This post explains how to send html emails from peoplecode using the html option in sendmail. This can generate really good looking emails that stand out from the usual text only emails used for notifications. So here’s how we do it. The HTML email that is send out by the above code would look like this in Gmail. As you may have noticed, this post was written long back. Since then, I’ve written about using MCF class and Generic Templates to send HTML emails. Have a look at those posts too before you decide on your approach. Nice info i just wanted to add to it .we can improve the code by using HTMLAREA and gethtmltext function. Glad that you found the code to be nice. I’d written this originally for an App Engine where we can’t use the GetHTMLText(). I’m glad that I came across your code and it simplifies my work. Happy to know that the code helped. When we use the sendmail function in Application Engine, the email traffic is tracked in SMTP logs. However, if we use this just in the fieldchange peoplecode, the email traffic is not logged. Logging the mails is important from our end since our clients sometimes ask for confirmation if an email was indeed successfully sent. is it possible to include variables in the mail body ? You can append anything to the text. I’ve changed the code to show how this can be done – have a look at &f_name and &l_name. Thank you very much for your response Rakesh! I want to load the html table dynamically. (ie) In the place of table data Roger Alex i want to pass variables to load table dynamically. @Amy – The code shows just that. Only difference being that it shows you how to get it working for John Smith. If you use variables (like I’ve done for John Smith) in the place of Rojer Alex, you would get what you are looking for. Could you please let me know how to load a table based on the number of rows that a sql fetches dynamically. (ie)the number of rows of the html table should depend on the number of rows that sql fetches dynamically. @Amy – You can do that by creating an SQL object to fecth the rows you are interested in and then build the html within a while Fetch loop. 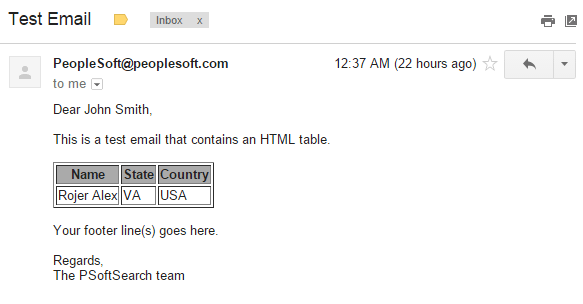 Rakesh, Thanks for the great information – found your info when I was looking to see where there email is distributed from – such as your email came from PeopleSoft@peoplesoft.com. We need to be able to dynamically change it based on the Business Unit that would be sending out the email. Where is this information stored and when is it attached to the email – dont see anything specific in your code. Warmest Regards and Thanks in advance for any assistance. Glad that you found the info useful. Today, I would use mcf class rather than Sendmail to send HTML emails. I’ve written about it here. If you still want to use Sendmail, it supports some optional parameters that would help you set the from address / reply to etc. The PeopleBooks entry is here. Can we embed the images as well in the mail body through Peoplecode/notification template ? If yes, please tell us how can we do that. Yes, you can embed images too. If it’s a publicly accessible static image, you can just use the html image tag to achieve this. If it’s a dynamic image, you may use the MCF Package to develop this. You would have to look at the PT_MCF_MAIL:MCFMultipart and PT_MCF_MAIL:MCFBodyPart classes. I tried using MCF Package, I got the image as attachment but in mail body its not showing image and showing the alt text defined in html image tag. Please help how can I show this image in mail body. Ideally, you would be embedding the image in the html as shown below. Thanks a lot for helping me out, I was able to send the image in mail body now. Glad to know that you were able to get it working! I am trying to send a mail using peoplecode sendmail function, in that mail I want to send the hyperlink and when user clicks on the link it should redirect to the page. I used URL maintainence page to create URL and using geturl i fetched the value and set the content type as Text/html but it is showing as text but not as hyperlink in the mail. Please let me know how can I show as hyperlink in the mail. You may want to embed your url within the a href html tag. 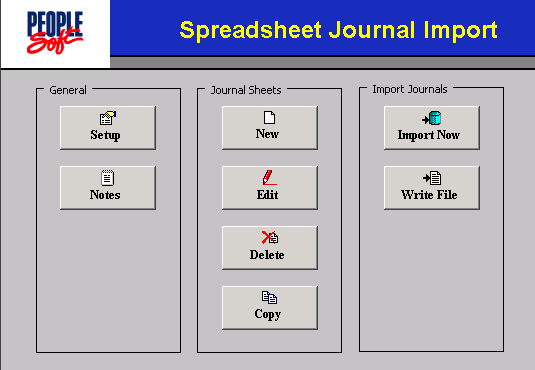 I have a business activity from which emails are being sent (workflow). I have to add an html link in the email body for which I added a field CONTENTTYPE with value “text/html” in the field mapping, and I tried putting google but the email body is still displaying the tags. I want the lick to be shown as “google” as per the code. Please help! I’m able to send a HTML email using MCF Classes but I would like to pass values (Record.Field.Value) dynamically into the HTML email. Please help!